1842-C Half Eagle - 1842-C Liberty $5 PCGS AU50. The rarest Charlotte-minted Half Eagle issue. Strong detail for the grade. PCGS: $26,000. Mintage 4,595. 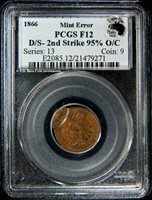 1866 Indian 1C Mint Error PCGS F12. D/S-2nd Strike 95% Off Center. 1842-C Liberty $2.50 NGC AU53. * Wish to pay by check or money order? Great, we'll knock off 3% from total. 1857-S Liberty $2.50 Gold NGC AU55. * Wish to pay by check or money order? Great, we'll knock off 3% from total. 1856-S SSCA2 $10 Gold PCGS MS60 CAC. Ex-SS Central America 2 with pinch. *CAC. Full Serif, Bold S.
1877-S Liberty $2.50 Gold NGC MS62. * Wish to pay by check or money order? Great, we'll knock off 3% from total. 1776-1976 200th Anniversary Silver Art Bar. United States Silver Corp 1975. One ounce .999 Fine Silver. Go First Class Silver Art Bar. One ounce .999 Fine Silver. 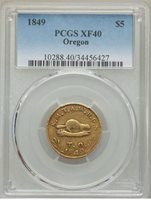 1849 Oregon Exchange PCGS XF40. 1910 Indian $2.50 NGC PR66. Attractive example; Roman finish. 1863 Three Dollar $3 PCGS AU55. * Wish to pay by check or money order? Great, we'll knock off 3% from total. 1874 Three Dollar $3 NGC MS62. * Wish to pay by check or money order? Great, we'll knock off 3% from total. 1859 Liberty $5 PCGS AU55. Very scarce & underrated. 1843 Liberty $2.50 NGC AU58. * Wish to pay by check or money order? Great, we'll knock off 3% from total. 1843 Liberty $5 NGC AU50. * Wish to pay by check or money order? Great, we'll knock off 3% from total. 1955 25C NGC PR68 Ultra Cameo. 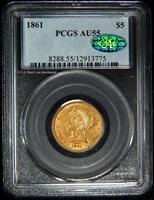 1871 Liberty $2.50 Gold PCGS AU55. * Wish to pay by check or money order? Great, we'll knock off 3% from total. 1861 Liberty $5 PCGS AU55 CAC. 1855-C Liberty $20 Gold PCGS AU55 CAC. Ex-SS Central America 2 with pinch. *CAC. Faint S. Notably scarcer than the 56-s & 57-s.
3 Pieces 1953 Vietnam Coin Set1953 S. Vietnam 10S NGC MS651953(A) S. Vietnam 20SU NGC MS641953(A) S. Vietnam 50XU NGC MS65Very undervalued! 1848 Liberty $5 Gold NGC MS63. Conditionally scarce. Lustrous & flashy.